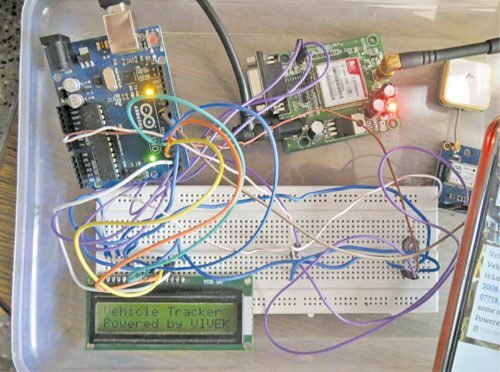 Presented here is an Arduino-based vehicle tracking system using global positioning system (GPS) and global system for mobile communication (GSM) modules. GSM modem with a SIM card used here uses the communication technique of a regular cellphone. The system can be installed or hidden in your vehicle at a suitable location. 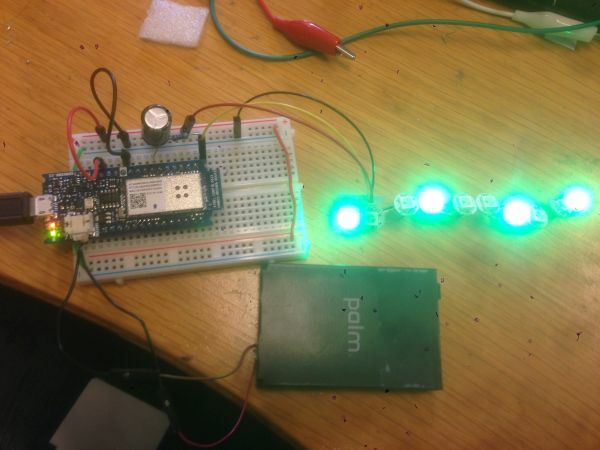 After installing this circuit, you can easily track your stolen vehicle using a mobile phone. The author’s prototype is shown in Fig. 1. 1. First, install Arduino IDE 1.8.3 in your PC. Add GPRS_Shield_Arduino’s header file into the library of Arduino IDE. Download the file from the link. 3. 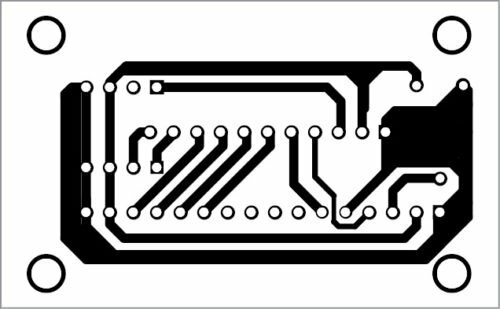 Once the code is burnt, make connections as shown in the circuit diagram. 4. 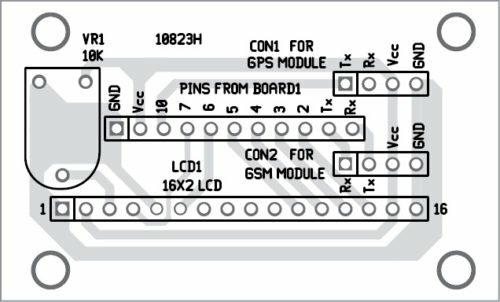 Insert a valid SIM card in the GSM module connected with the Arduino board. Make sure that this SIM has necessary balance to send alert messages to the user’s mobile phone. 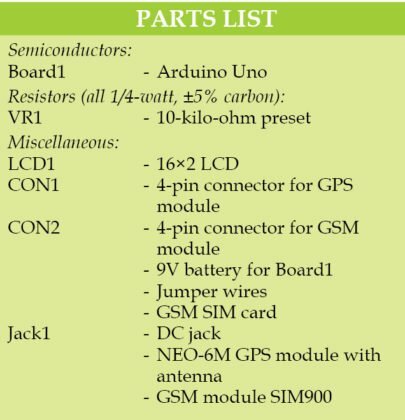 An actual-size PCB layout of GPS- and GSM-based vehicle tracking system is shown in Fig. 3 and its components layout in Fig. 4. Once you are done with connections and uploading of the code, place the system (Arduino, LCD, GPS and GSM with SIM card) in the vehicle. Now it’s time to track the SIM card inserted in the GSM module. To track the SIM card, send an SMS to the mobile number of the SIM card by typing “Track Vehicle” from your (user) mobile phone. After sending the message, wait for a few seconds until you receive location detail of the SIM card in the form of latitude and longitude values on LCD1 as well as in your mobile phone. Vary preset VR1 till you get clear visible text on the LCD1. After getting the latitude and longitude position (in decimal format), convert the first four digits of these values into degrees and minutes like 28°38’ and 77°13’. Enter these values in the search box of Google Maps and then click “Search” button to find the exact location. The system can be used by individual vehicle owners as well as organisations to locate and track their vehicles. 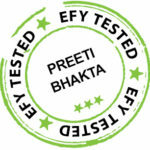 Organisations can use it to track the status of their product delivery by trucks at all times. It also helps owners to keep tab on their driver, preventing vehicle abuse and thus resulting in significant cost-savings. The system can be easily installed in any vehicle such as cars, boats and motorbikes.